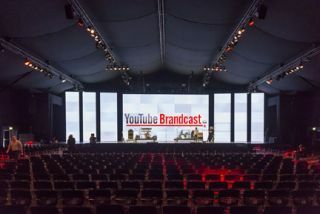 The power and potential of global exposure in the star-making process was one of the highlights at a recent YouTube Brandcast special event for 900 invited guests, staged in a large tensile structure at Syon Park, west London, with XL Video supplying LED screens, cameras / PPU and media server control to producers, Flourish Creative. A line up of musicians, performers and brands – in whose success the YouTube platform has been instrumental - celebrated the worldwide reach of the medium and its promotional possibilities. XL’s Project Managers Guy Vellacott and Andy Mayneord oversaw the event’s video aspects, and original playback content was designed and supplied by US based companies, Obscura and M-Ocean. Vellacott and Mayneord worked alongside Flourish Creative Director Guy Tremlett who conceived the event’s overall production design. The space was divided into two areas and the stage and set for the main performance space was built by Stage One. At the back of the stage in the main room, XL supplied a large 11 x 6 meter Absen 6 mm high definition LED screen, built on motorized trucks so it could be opened and closed for entrances and exits. This was flanked by three side panels left and right, two measuring 2 x 6 meters and four at 1.5 x 6 meters. In the reception areas, more Absen 6 mm LED was used to create two 2.5 x 1.5 meter screens either side of a DJ booth. Two 85 inch plasmas were flown as prompt screens. The camera set up was four Sony HXC100s, one fitted with a J-50 long throw lens positioned at FOH, two with J40 lenses on either side of the stage and a hand-held at the front. These were fed into one of XL’s compact PPUs and mixed by Nick Fry. The PPU system was engineered by Gerry Corry and included ISO and TX records to Ki-Pro machines. Two Pandora’s Box media servers were supplied to manage all the pre-recorded content being output to screen, run on site by XL’s crew, together with a third Pandora’s Box that handled all the downloads and content programming.